Let’s not kid anyone, we like what Polaris has done with the 2011 Rush. From a single model in 2010, there’s a fleet of them for 2011. And that’s not counting the “Rush-like” crossover and mountain models with the Rush front end and extended length tunnels and tracks. Still there is only one true Rush with the outside the skid frame rear shock. 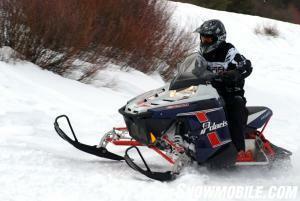 We had a bit of trouble accepting Polaris’ total Rush hyperbole in its inaugural season as a sled for all reasons. Yeah, yeah it was good, but in its sole mockup, we couldn’t see it as both a full-fledged mogul basher AND a smooth mile maker. In reality, apparently, neither could Polaris. Where the 2010 Rush was fitted with all the best Walker Evans shocks and inclined more to ditch running, the 2011 Rush has multiple versions — five, in fact! — to suit a wide swath of riders. In addition to the good but not all-powerful 600cc Cleanfire Twin fitted to the sole Rush model last season, the 2011 Rush offers an 800cc option to power two new versions. 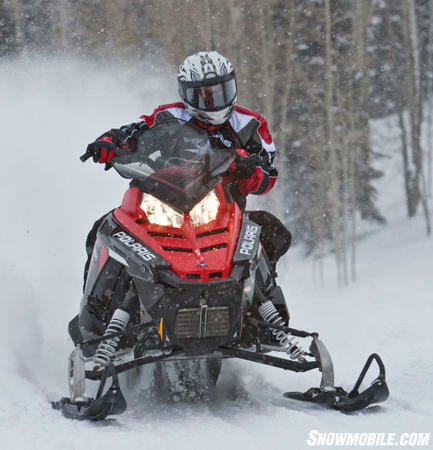 The top of the line 800 Rush Pro-R carries over the Walker Evans shock packages and substantially more go-power for lake running and pushing through snow-filled ditches. 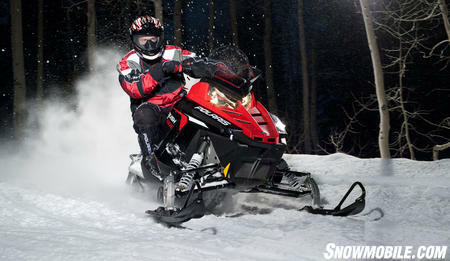 This is the Rush for the most serious Polaris power rider. A notch down from the Pro-R comes a new 800 Rush, which may be the best all-around version for the mileage maker who likes to hammer the throttle on the long straights. Then there are two similar versions with 600cc power, the 600 Rush Pro-R and 600 Rush. Plus there’s a seriously nice “luxury” version based on the 600 Rush but equipped with bags, mirrors and even a power outlet for a heated faceshield. The base Rush comes in a bright red with black trim and uses Fox gas shocks with internal floating pistons. Having sampled all of the 2011 Rush versions earlier this year, we came away surprised as we found ourselves favoring the base Rush models over the tricked out Pro-R versions. Some of this has to do with our season-long evaluation of the 2010 Rush we had. It was fitted with bags and luxury pieces like electric start, mirrors and a tall windshield. We equipped ourselves with what has become the 2011 Rush LX. Of course, our version came with Walker Evans shocks, and the 2011 version comes stock with Fox shocks. Still, our experience taught us that it takes time and effort to set up the new Pro-Ride to get the best ride and handling from the Walker Evans shocks. We discovered with the 2011 800 Rush that Polaris engineering made the ride and handling compromises front and rear when it spec’d out the internal floating piston Fox shocks for the Pro-Ride A-arm front end and external shock of the rear suspension. And they did a truly nice job in balancing the sled for every day trail riding with the occasional big bump run. That was no small accomplishment as we found balancing the Pro-Ride rear set-up took a lot of patience. The 800 Rush decked out in an optional “retro” package. At the new model evaluations Polaris had scores of engineers and technicians available to assist the various media types get a comfy ride. But we’ve discovered that we ride lighter than our actual weight and much prefer the regular rear spring to the “big boy” spring and like a much softer shock setting than Polaris engineers wanted to give us. We are from the school of letting the shock’s stroke work for us. We want to get a bottoming out first and then start setting in some stiffness to reduce the bottoming. We want to utilize every centimeter of shock stroke we can. 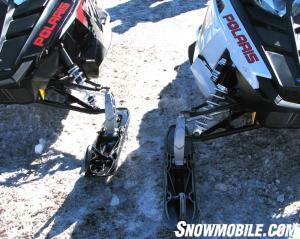 In the base Rush models, Polaris engineering had to arrive at a compromise of soft to stiff action versus letting the consumer find it by adjusting the shocks themselves. Polaris engineers give you a very well balanced front to rear package that handles the stutters as you would expect from the Pro-Ride rear design and even went a bit over toward the softer trail rider side, versus the hot rod set-up of the Pro-R. The base Rush model (left) uses Fox shocks while the Pro-R version has adjustable Walker Evans shocks on the Pro-Ride front end. Knowing the way the two suspension packages work, as comfy-oriented trail riders first, we might very well recommend saving the US$1,500 extra for the Pro-R versus a base 800 Rush and sticking with the softer sprung base model. Power from the 800cc Liberty Twin is the same and you get the same Polaris P85 driven and TEAM drive clutch package with either 800 Rush model. 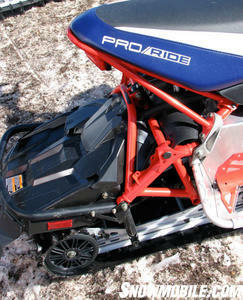 There are some extras with the Pro-R, but we were very impressed with the base line 800 Rush. You get all the latest “goodies” in the base model. There’s a new mid-flap integrated cooler to promote consistent operating temperatures in low-snow conditions. There’s a multi-function gauge that lets you chose between the readouts for speedo or tach, plus it can track hours of operation, trip distance and overall mileage. The Rush features the Phantom hydraulic brake for consistent stopping and the Polaris-exclusive stainless brake lines offer a precise and predictable brake feel and fade-proof performance. There is a difference in tracks between the two 800 Rush models. The standard 800 Rush comes with a new-for-2011 15″ x 121″ x 1″ HackSaw track that features lightweight construction for enhanced top speed and has optimized outer lugs for a nice balance of traction and smooth cornering. The Pro-R is fitted with the RipSaw track and slightly taller 1.25 lugs. The Rush gained upgrades for 2011 like this new rear mudflap and a rear cooling extrusion to help maintain more consistent temps in low snow conditions. The Rush features unique construction that includes Polaris’ use of structural bonding — an aerospace- based technology that reduces overall weld length, rivets and fasteners. The steering sits positioned over the engine, which permits the engine to be mounted lower in the chassis, for lower center of gravity and better overall balance. Refinements for 2011 include upgrades on the rear suspension that include a revised rail profile for greater top speed, a new rear crank for reduced weight and an updated front torque arm for improved stud clearance. Now in its second full season, the Polaris Rush has expanded to five separate models to better satisfy the different needs of bump riders and high mileage riders. While we greatly appreciate the quality and adjustability of the Walker Evans shocks, we figure that the base 800 Rush and its “compromise” shock package may be the better overall choice for the larger number of trail riders. Basically, we’re saying that the standard Rush for 2011is the better overall choice for every day riding. Bassett's Blog : Power Steering Coming Soon?